The last few days have been ones of wonder and excitement. 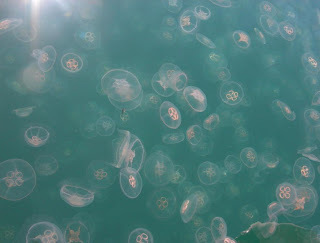 On our way from Punta Mita to San Blas we ran into a section of ocean that was literally carpeted in small jelly fish. A short distance into this we started to see the sea turtles that feed on these jelly fish. For about 2 hours, sea turtles were everywhere you looked around the boat…hundreds and hundreds of them…too many to count. Straight out of “Life of Pi”, but without the symbolism. Leaving the sea turtles behind, we almost motored straight into a long line net. These nets are suspended from rope and buoys that float on the surface of the water, just waiting to snag some poor unsuspecting catamaran propeller. Luckily, Tony saw the line when we were just 20 or so feet from it, which is a feat because the floats are usually 7 Up or Coke bottles and really tough to spot. We made a hard turn to port and followed the pop bottles for about 20 minutes before finally finding the end. That thing had to be at least a mile long! Wouldn’t want to run into it in the middle of the night! Time to hoist those sails....only 10,052 more turns of the winch, Tony! Piedro Blanco. That's a lot of bird poop. On to San Blas which is about 11 hours north of Nuevo Vallarta. The seas were pretty calm and we ended up motoring almost all of the way. The prediction was for southerlies, but what wind there was ended up coming directly from the west. There is only open ocean in that direction, so a pretty large swell developed. We knew that the marina was up a river which means that we had to cross over a sand bar at its entrance. This always enhances the waves and it was a pretty exciting trip into the river as we got up to about 8.5 knots surfing down the front of a wave. No problemo, but a small hint of what was to come. 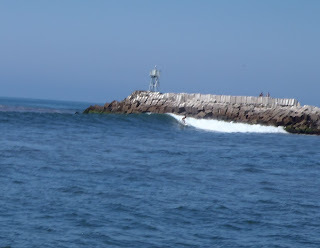 The next morning was the start of our overnight leg to Mazatlan. As we neared the river exit Tony spotted a surfer in the waves being created by the breakwater on the right hand side of the river. Kathy looked left and saw 3 or 4 more surfers in good sized waves on that side. Jesus…..we’re on a sailboat, not a surfboard! There was only about 40 ft of reasonable water between these two breaks and it looked damn narrow to us. However, to the sounds of cheering from the surfer dudes/dudettes, Vakasa made her way through the exit and launched herself safely over a couple 7—8 foot waves. Let’s hope someone got that on U-tube! The overnight trip was pretty benign, with not much happening until Tony’s 3 am to 6 am shift. Three hours of sitting at the helm with nothing but the instruments and the stars to stare at can make you a little stir crazy. He thought he was seeing things when dozens of little dots started appearing on the radar screen. 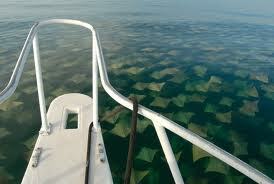 OMG…..we must be running into a fleet of pangas! Nope, just thousands (yes, he swears it was thousands) of sea rays jumping out of Vakasa’s way and scaring the heck out of him! We arrived at Mazatlan at about 11 am in the morning after sailing for most of the previous day but motoring all night long. Again, the weather was from the west, but the winds were light and the swell seemed pretty small with long periods between. However, as we closed in on the entrance to the marinas (another river mouth) we couldn't believe the extent of the surf and waves breaking at the river mouth. Being way more savy in this department now, we called the marina and were told that the entrance was closed due to high surf. Damn it….we’ve been up all night, and were looking forward to tying up at a dock and going to bed. What now? Mazatlan has developed a bad reputation for theft of dinghy motors and the occasional onboard robbery and unfortunately the most common crime area was the only anchorage open to us in these conditions. We headed there; chained the dinghy and motor to Vakasa, hid our valuables, paraded our vicious guard dog around the decks a few times, locked ourselves inside the boat, armed ourselves with flare guns (just kidding, although a really scary neighbour did recommend it) and hit the sack. The Silver family actually took this ferry to La Paz on their North American tour back in 2000....looks just the same now...bet the berth ceilings still leak! We stayed at this surprisingly nice anchorage for a couple days and had no problems with banditos. In fact we had a wonderful time, which included a great bus ride into the old town where we window shopped for a few hours, walked the Malecon (sea wall) and enjoyed beer and guacamole at a palapa bar. The anchorage was well protected with lots of interesting tourist and commercial boat traffic going to and fro. We felt that as long as we didn’t leave valuables on display, we were pretty safe. Now, I know that this is getting long, but we still had one more river entrance to tackle and we did that this morning. After being assured that the entrance to the Mazatlan marinas was now open and the dredger was not operating, we motored on over. The surf was not nearly as big as the other day but it was still worth worrying about. We timed things perfectly and started in the entrance just as a huge tourist catamaran rounded the corner on its way out. Abort! We pulled a “U-ey” and headed back out. Attempt number two.... We lined ourselves up and started in again. S&**! Here comes another boat. Abort again! Third time lucky?.... We actually made it into the channel this time, with just a little swell helping us on our way. But as we started to round the corner we saw that the dredger (yup, the one that wasn’t supposed to be working today) was in the middle of the narrow (we mean NARROW) channel and its pipes were taking up 2/3rds of the room. The driver of the dredger frantically waved us to the right and we managed to squeeze through with only about 3 ft on either side of Vakasa….wild-eyed Mexicans to port and scary sharp looking rocks to starboard! Now that's a narrow entrance! The dredger at anchor. When we came in it was in the middle of the channel which didn't leave much room for Vakasa! Now we’re almost finished…..but not quite. It turns out that we’re on a falling tide, which normally means nothing in Mexico as the tides are usually so small. But today the river current was running really fast. 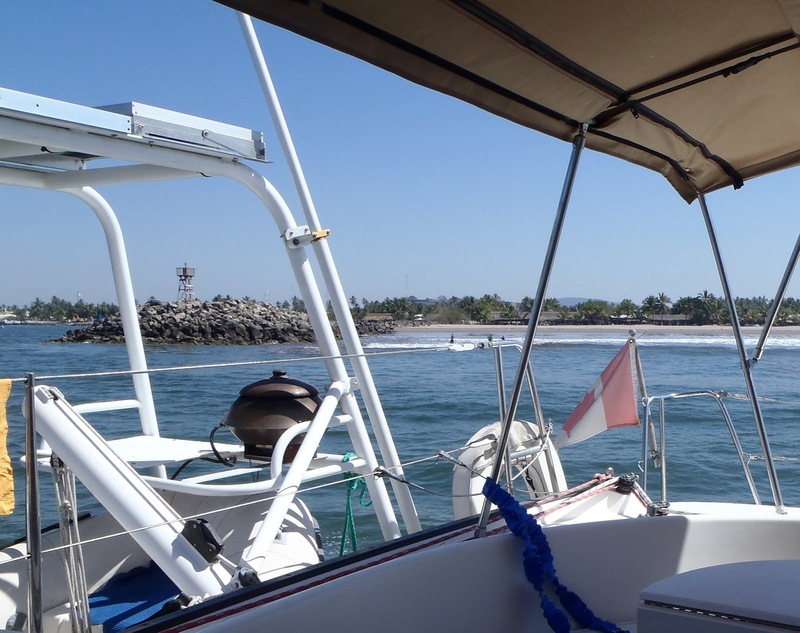 You could actually see small whirlpools and white-capped current waves throughout the marina. It took Vakasa’s wonderful and talented captain 4 tries to get us to the dock.